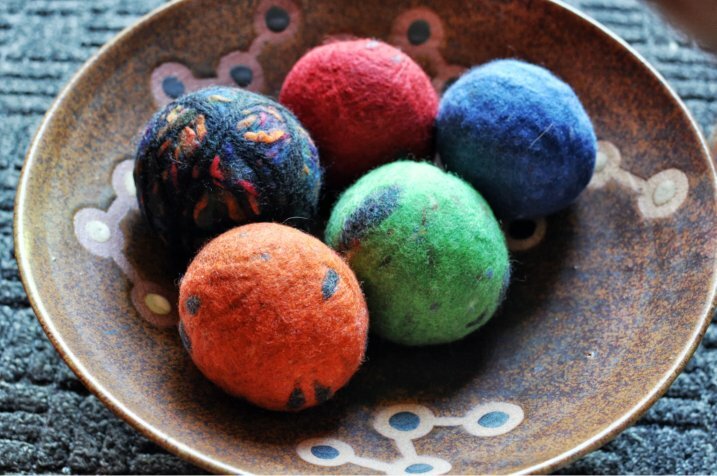 I made sets of these felted balls a few years ago as presents for friends and family members. 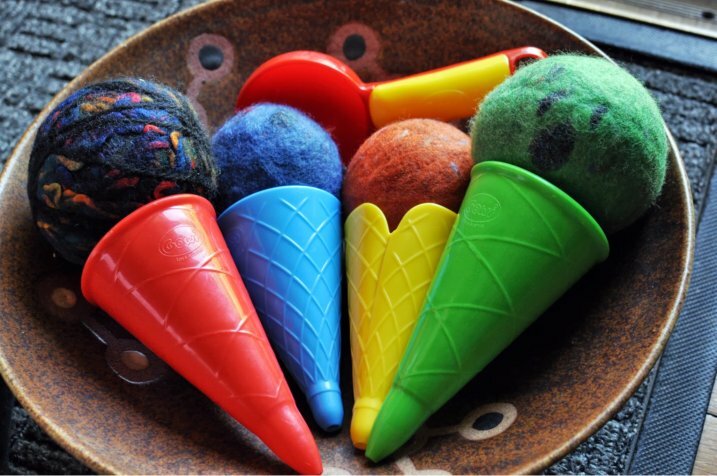 Put them together in sets – half in one color, half in another, with a smaller different colored felted ball and you have an indoor bocce ball set. Start with felted wool sweaters. 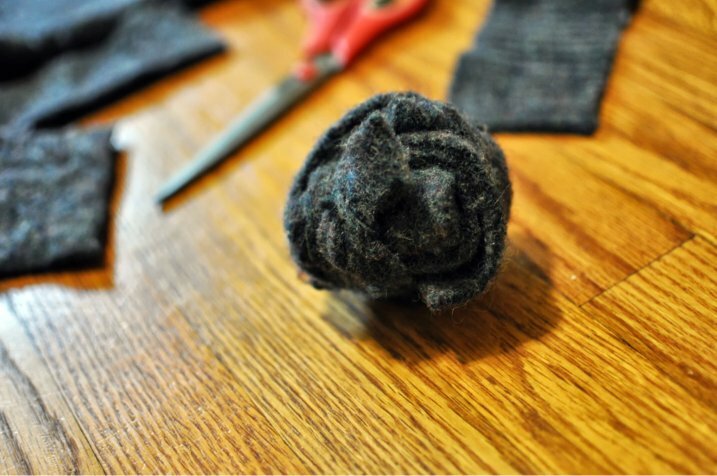 To felt sweaters, take 100% wool sweaters and wash them on hot and then dry them on hot. 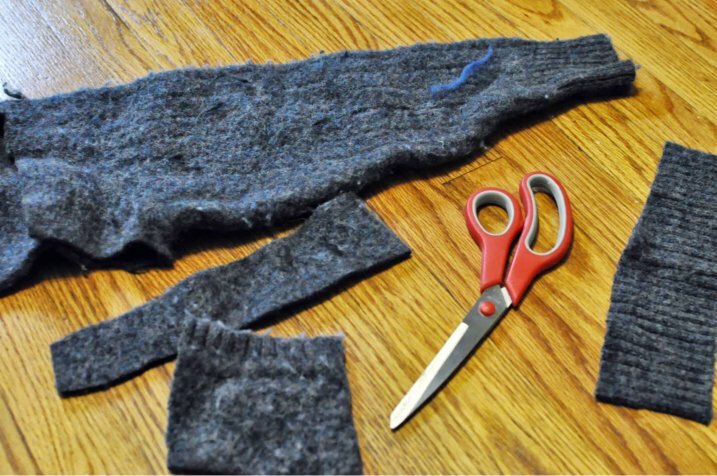 Cut felted sweaters into strips and rectangles. Begin fashioning the rectangles and strips into lumpy spheres. Use the strips to tie knots to hold it all in place. 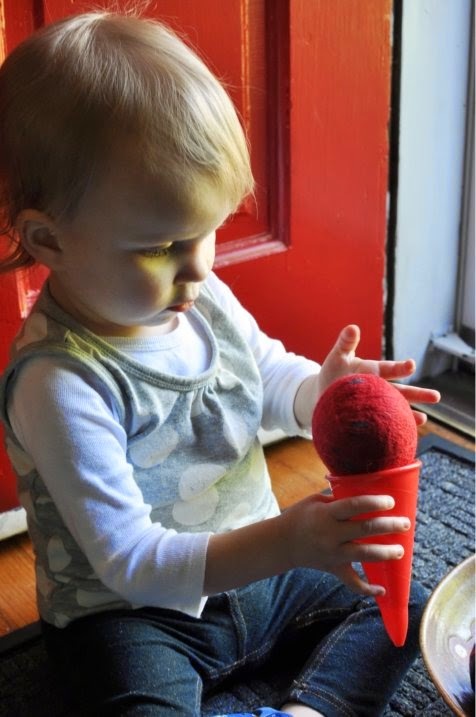 It’s ok if the spheres look really lumpy and messy – we will fix that soon enough. 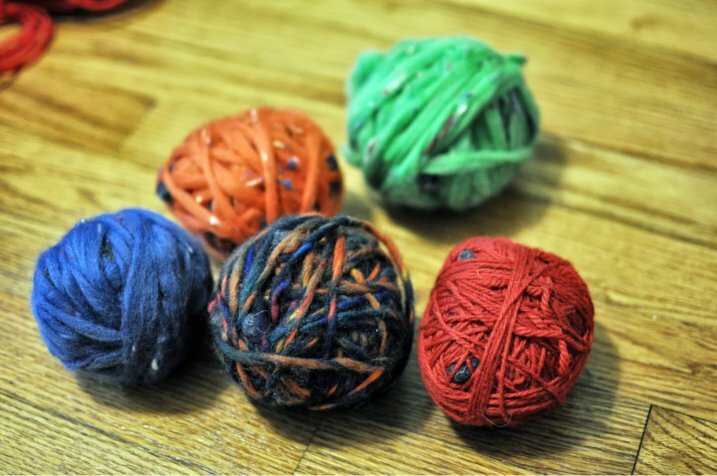 Once you have the approximate shape and size for your sphere, wrap the felted core in roving wool or 100% wool yarn. Wrap until the felted core is completely covered, making sure to wrap in several different directions around the sphere. Here are my 5 wrapped orbs. 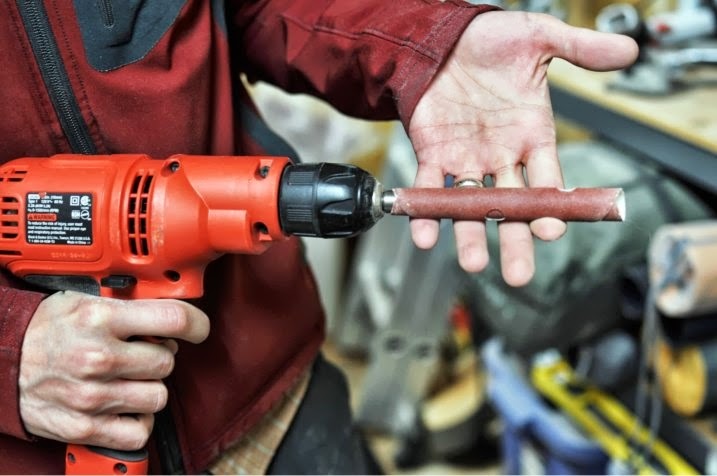 A few pockets of felted core showing are ok, however they will most likely show up in the finished product, so if you want to avoid that, wrap completely. 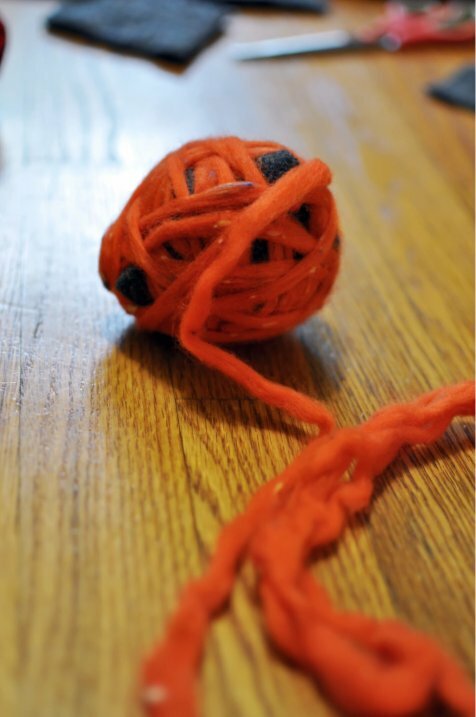 Carefully slip the wrapped orbs into OLD socks, push down to the toe gently. Twist the sock closed and secure tightly with a twist tie. Wash in hot water and a small amount of detergent. 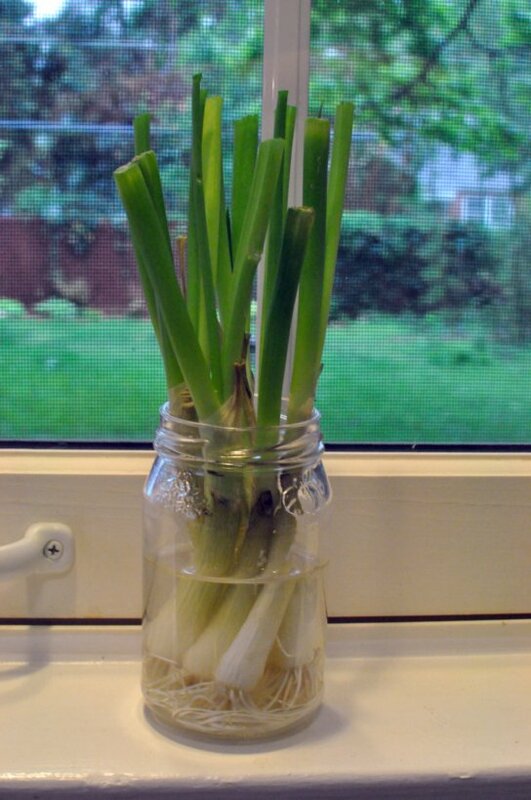 You can also boil them in a large stockpot for 10 – 15 minutes for a quicker felt. However, only boil like colors with like colors as the dyes tend to run and bleed in boiling water. 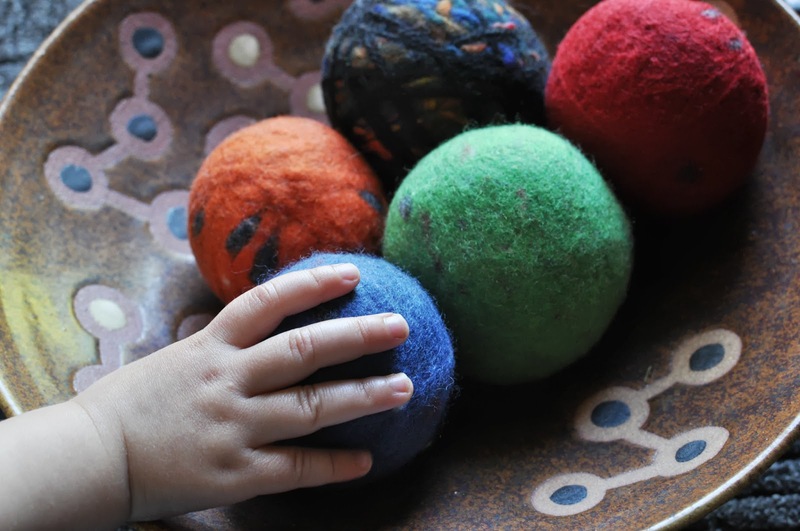 Greta immediately loved these felted balls – grabbing for them while I tried to photograph them. 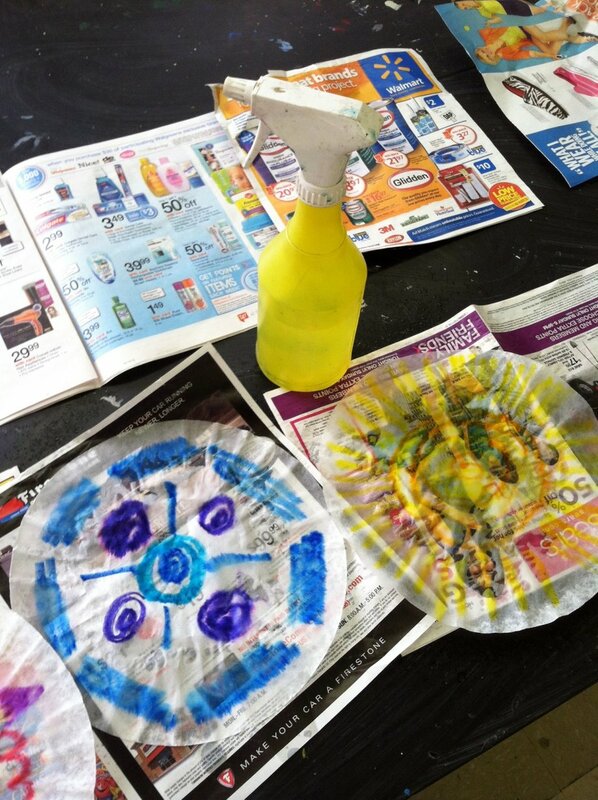 This is a fun and easy day project that requires minimal planning, prep, time, or skill. 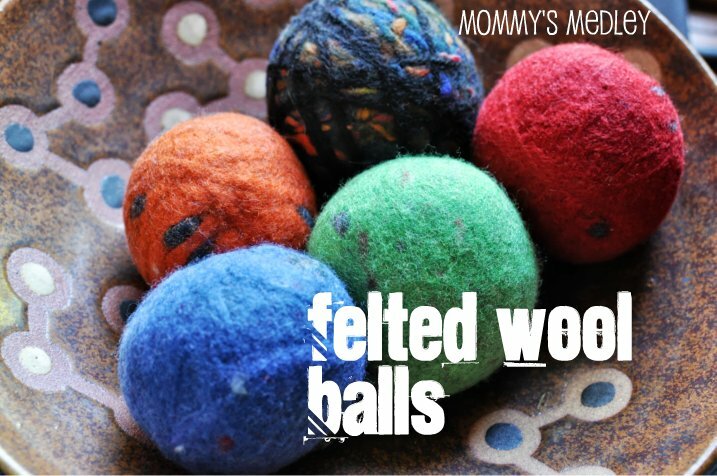 The nice thing about these felted balls is that if they should happen to get funky just throw them in the wash and dry them. They are already felted, so no need to worry about shrinking any more. 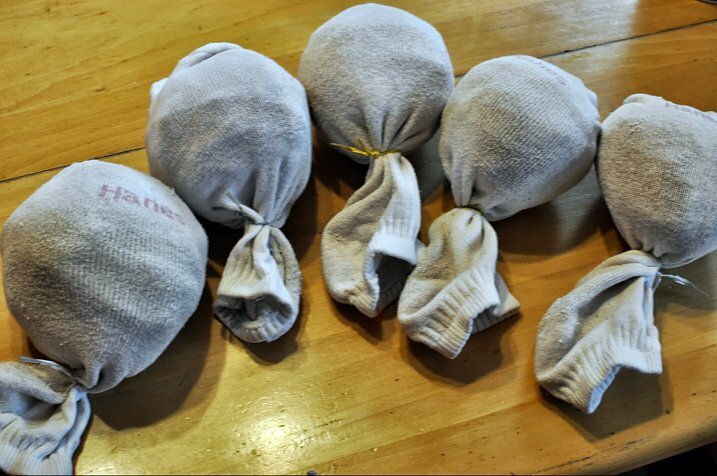 Some people even add scented oil to these and turn them into natural dryer balls/sheets. This weekend went by so quickly! We started off with outdoor movie night on Friday with a few friends. I made a cake for a friend’s half birthday and decided to throw in another adult-only dessert for the evening. We are into full-fledge use it up mode around here. If we don’t use it in the next couple of weeks we will be dumping a great deal of food items in the trash or into the arms of friends. Three different kinds of mustard, 5 different BBQ sauces, 2 jars of lime juice, and canned tomatoes anyone? 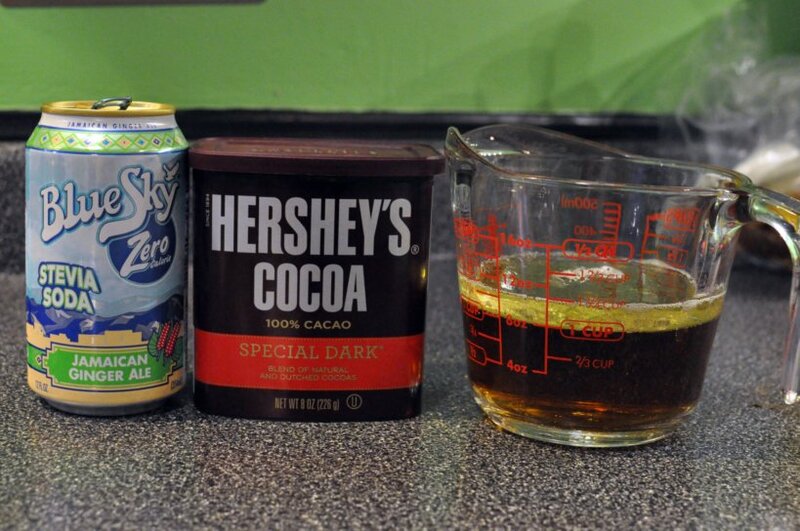 This was one of those items in the cupboard begging to be used – along with the triple sec I added to make this an adult dessert. 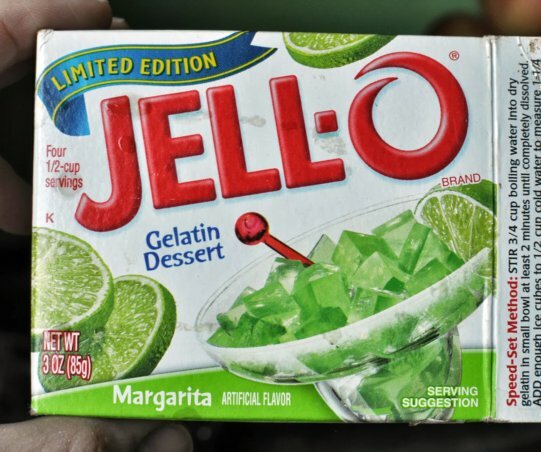 I am not a huge Jell-o fan. So, if I do make it, there needs to be a large enough crowd to finish it off. I only had one small helping of this – I think it’s the texture of Jell-o that gets me. 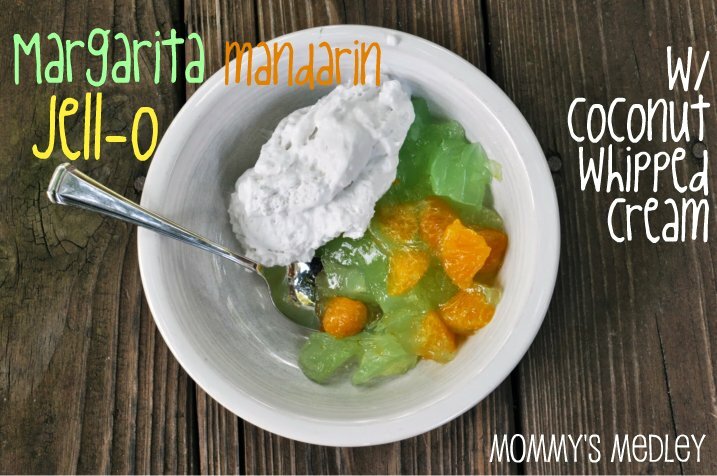 I added mandarin oranges for a little extra oomph and flavor. I made a batch of coconut whipped cream as a topping. This absolutely made this recipe delicious. We spent most of the weekend hanging out on our deck, soaking up the sunshine and warmth, and trying to get Greta over her fever. We’ve had an exciting past couple of weeks though – check back soon for house news on our front! 1. 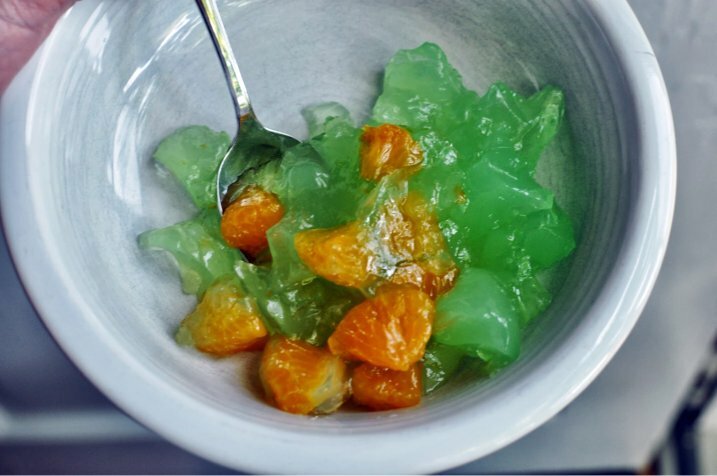 Pour Jell-o mix into medium bowl. Add 1 cup boiling water. Stir until well combined. Add up to 1 cup of cold triple sec (I used ¾ cup triple sec and ¼ cup water) and mix well. 2. Place in refrigerator and allow to set for 1 ½ hours. Add in 1 small can of mandarin oranges, well-drained. 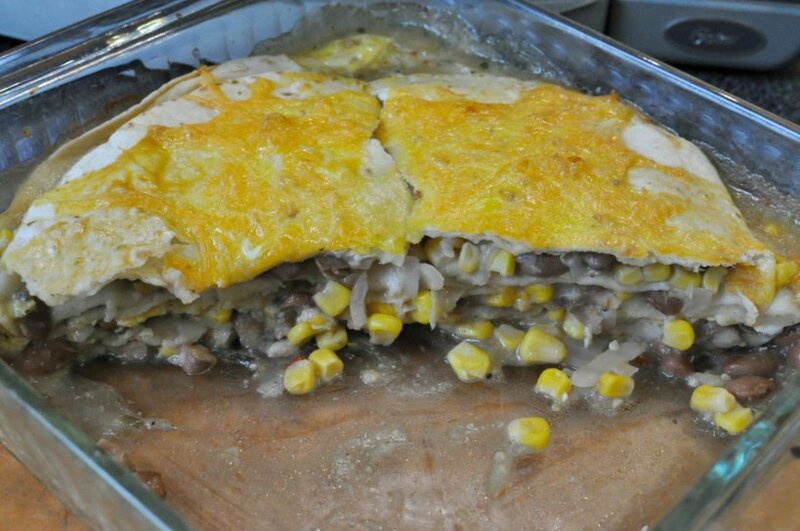 Mix well and return to refrigerator for 3 ½ more hours or until set. 3. Serve cold with a helping of coconut whipped cream. 1. Allow 1 can of coconut milk to sit overnight in the refrigerator. Make sure the coconut milk is not the light variety, as it will not whip very well. 2. 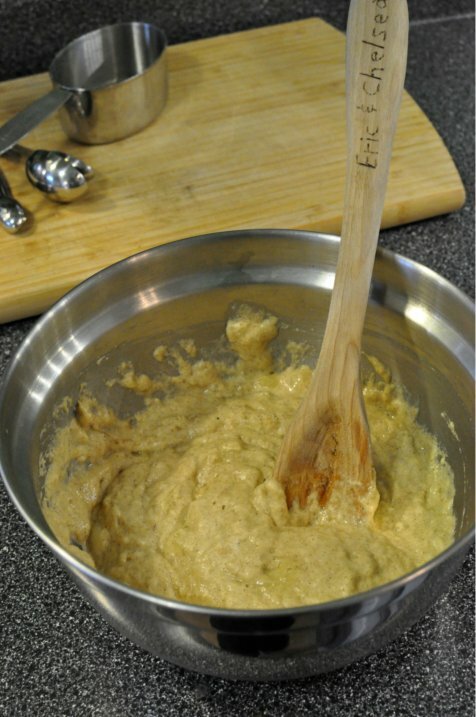 Open can carefully and using a spatula, scrape off the top creamy layer into a mixing stand bowl. Stop when you reach the coconut water on the bottom. Save this for other uses. 3. 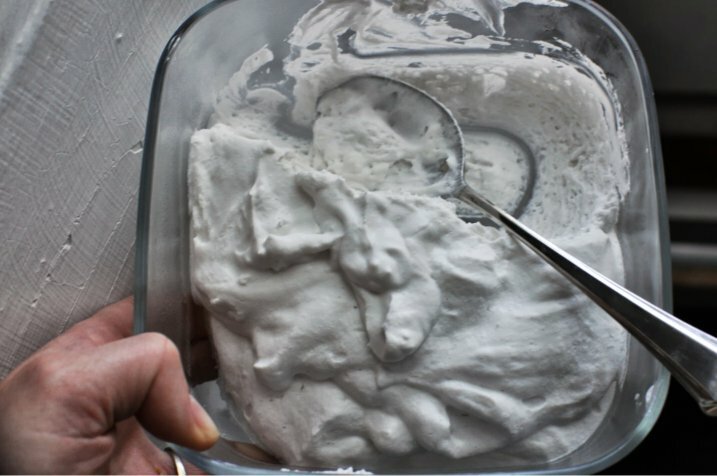 Whip cream for a few minutes or until stiff peaks are formed. Refrigerate any unused cream. This printer’s shelf was a wedding gift from a friend and admittedly it has been hanging out in my art room for quite some time. Having seen various ways to turn these into lovely works of art for displaying jewelry, I decided to take this in my own direction, and make it a memento of our home in North Carolina. The only reason Eric is holding it and it is not adorning my wall is that we are in the throws of packing right now – 2 weeks and counting! 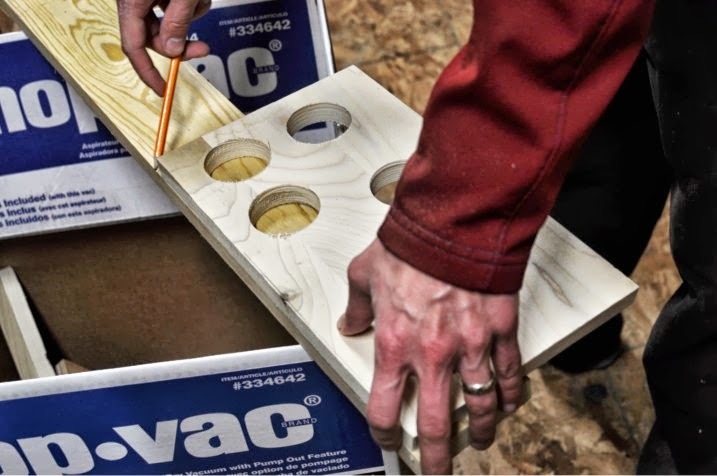 This is an easy project that any novice can complete with ease – with only 2 or 3 steps total. 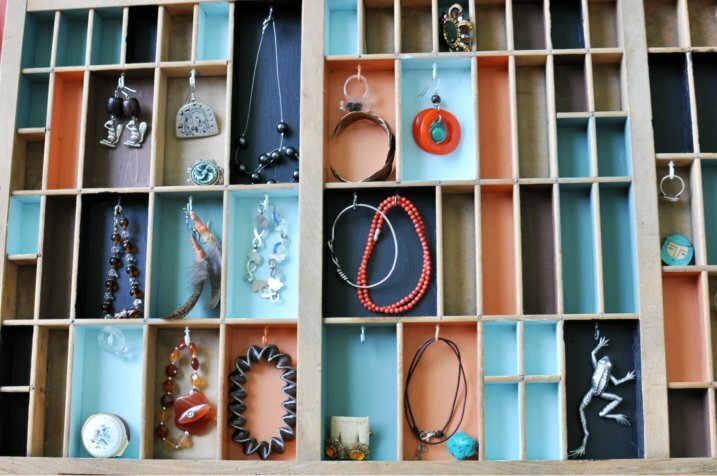 Clean it up first and then drill holes into the boxes where ever you want the hooks to be placed. Insert small metal hooks. I put most of mine in the middle – I think I will go back and add a few more in some of the boxes so I can maximize the storage potential. 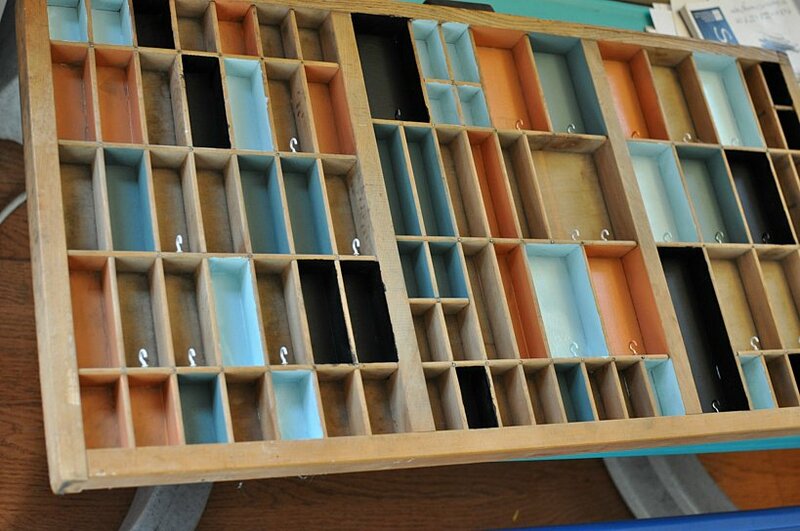 To add some funky flair to my jewelry storage, I painted the insides of the boxes using old paint colors from our house. The orange is my current dining room, the black the chalkboard wall in the play room/art room, the blue our bathroom, and the blue-green our bedroom. This way, in the new house, I will have a memento of our first house and its fun colors. I only wish I had the paint from the kitchen – I love that green. I cannot wait to hang this in our new bedroom – let the debates begin on new paint colors! 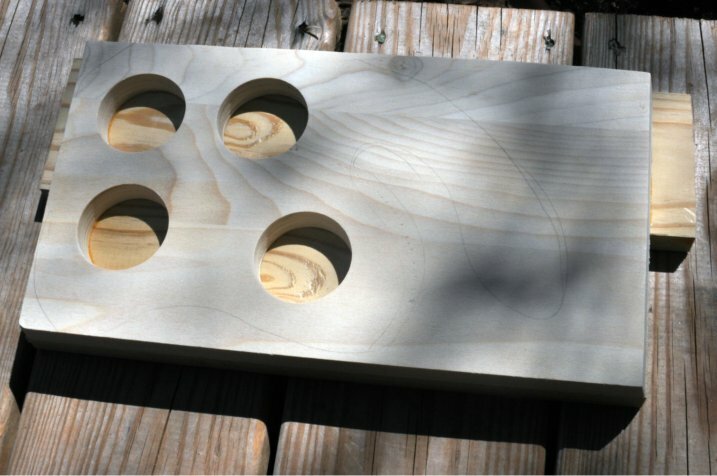 In response the great interest in the first installation of the DIY Beer Sample Paddle, I have another post for you on this very same topic. This time however, there are more detailed images and steps to explain the process. There are no plans however, as the design seen above was drawn free-form. 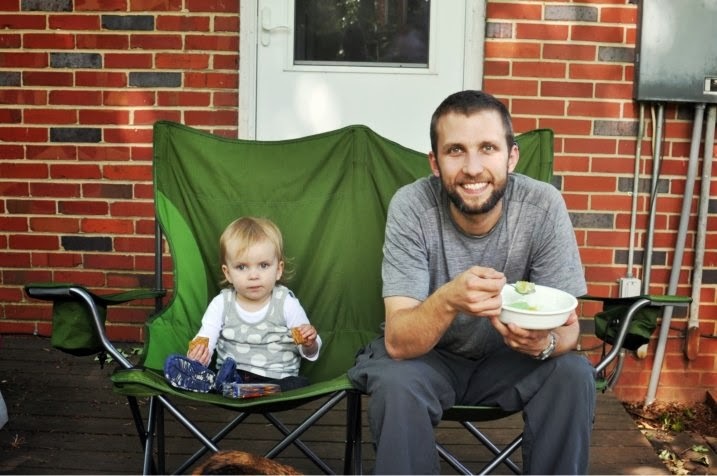 Eric wrote this post, so I guess it is more of a Daddy’s Medley, this time. 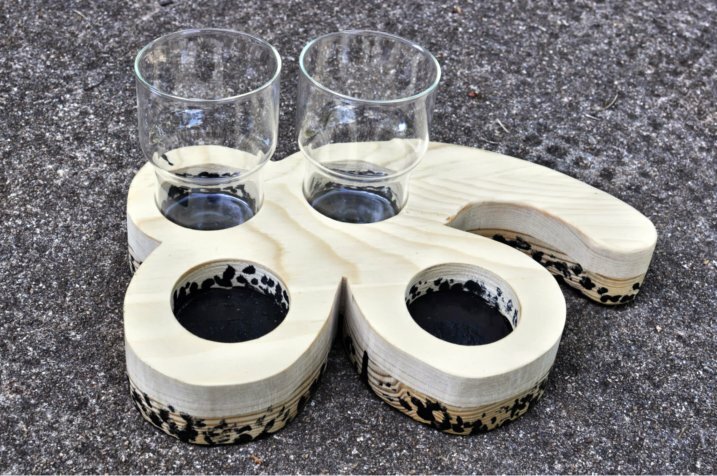 I set the glasses out on the wood and marked the locations before drilling. 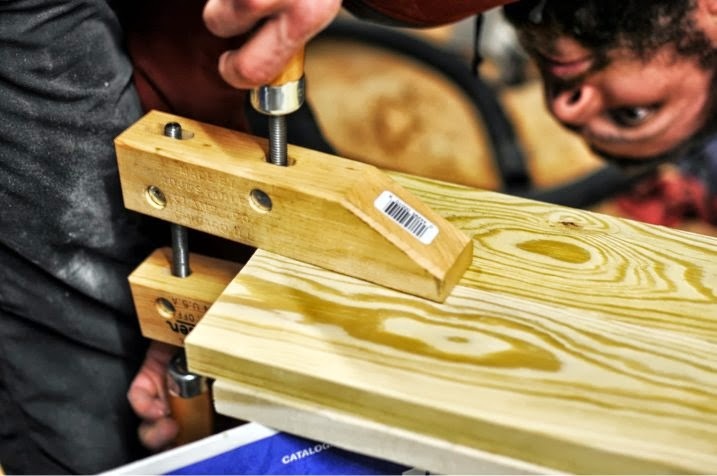 The holes are hand drilled, I would recommend clamping your wood down to your work surface, with a large bit the drill can catch the wood and kick it around. 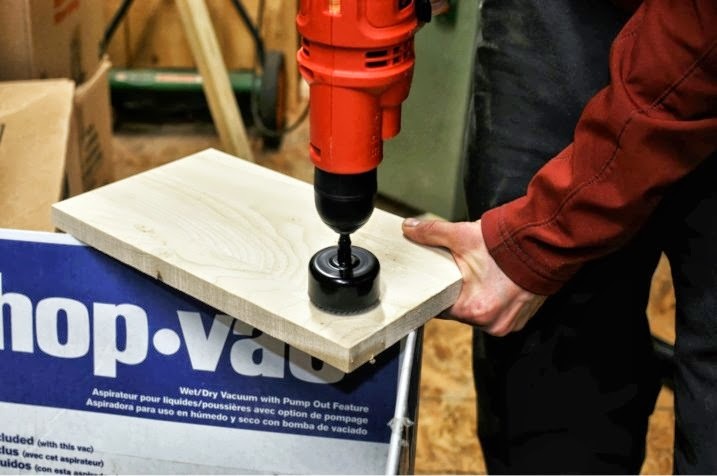 If you have access to a drill press, use it. 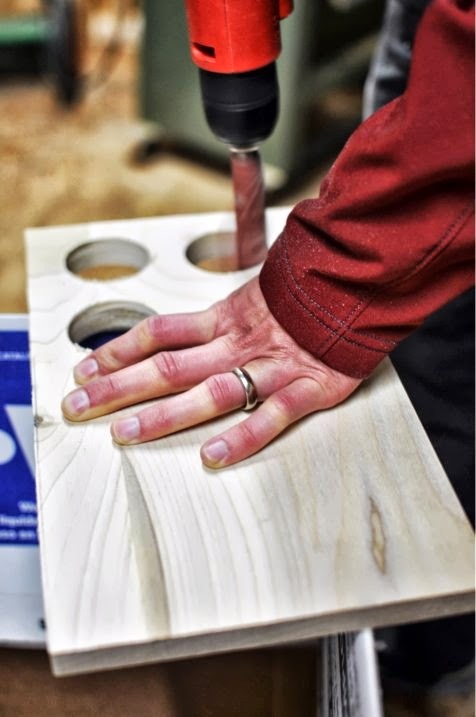 Know what size glasses you intend to use before drilling your holes, do a test fit on scrap wood. Be sure to check how close the glasses will sit to each other. This is scrap poplar left over from another project. Any type of wood will work. 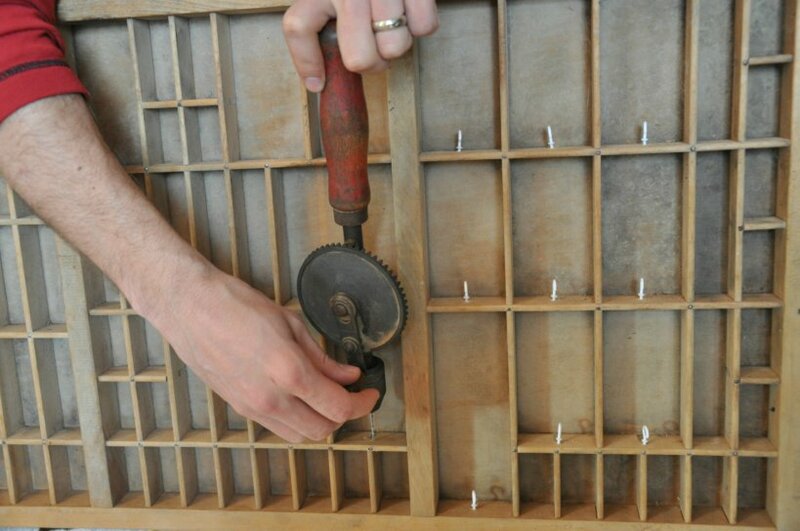 Tracing to ensure a perfect fit. 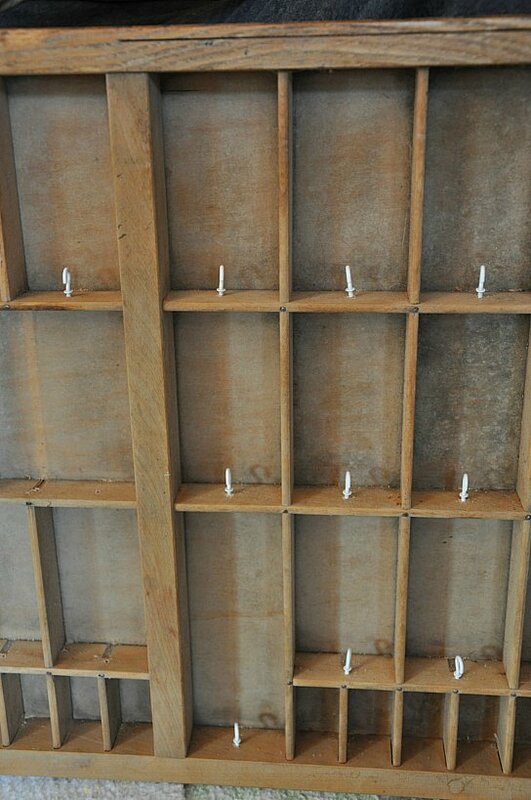 The base was from a 1×4 pine plank. Not everyone has access to all the tools out there. 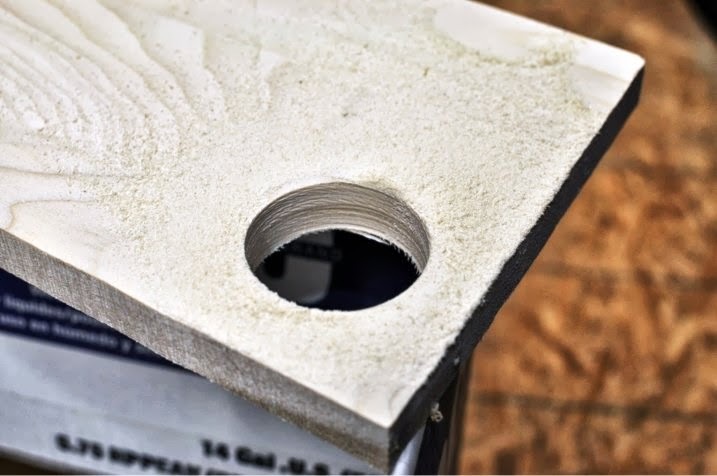 If you do not have a spindle sander, a piece of sand paper taped and wrapped around a ½ inch drill bit works well enough to sand inside the hole cuts. 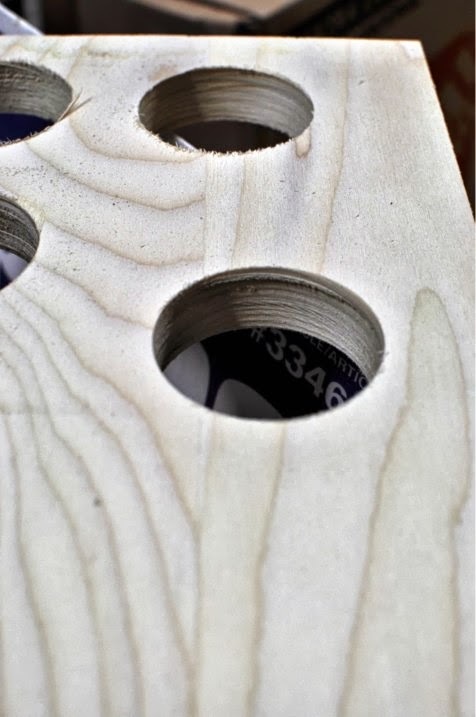 This method worked well for smoothing the inside of the holes. It also made the fit for the glasses absolutely perfect. 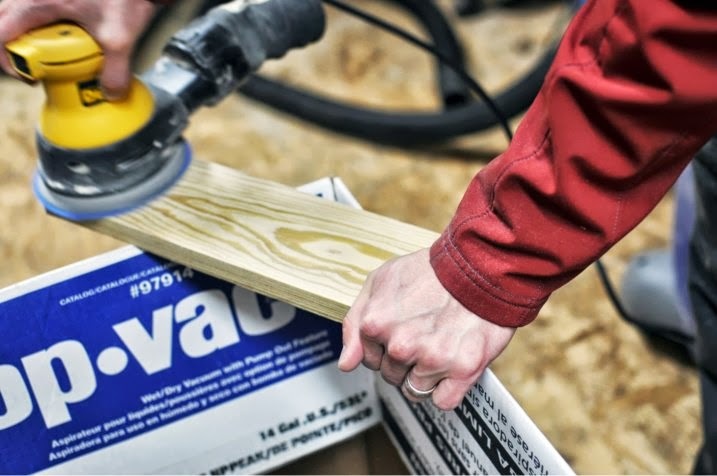 Prepping by sanding, the surface before gluing. 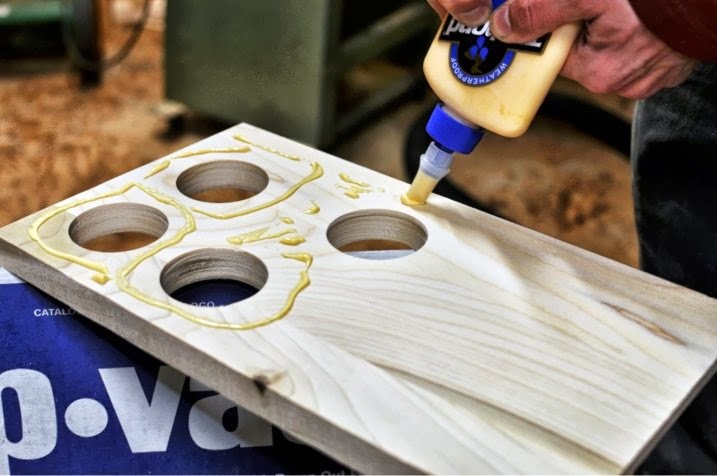 Apply the glue and wipe off any extra after clamping. The more even the pressure the better the fit. 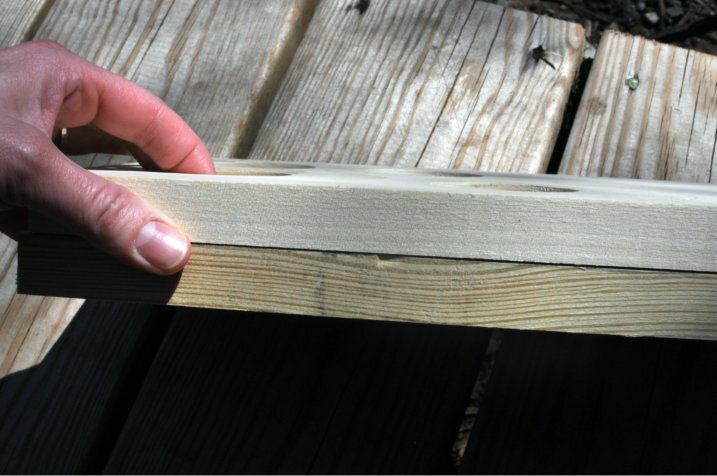 The edges do not look perfect, as the wood was not planed. 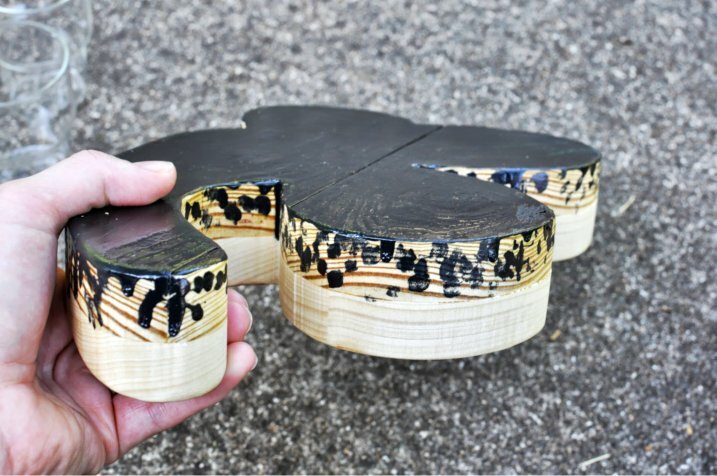 Allow the glue to dry, and then after trimming it will look much better. Rough sketch of a design for the finished flight paddle. 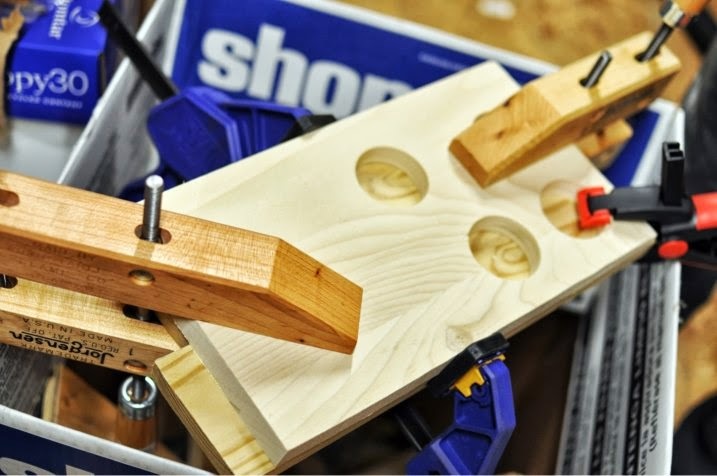 I wanted to create something more organic and free form than the previous simple plank form. 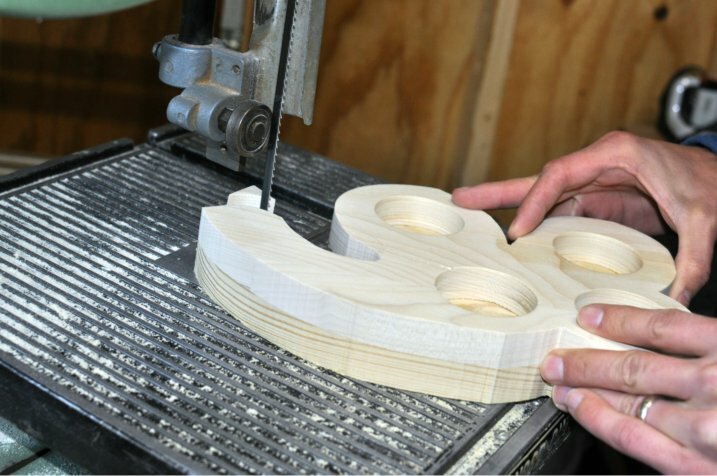 Bandsaws can use a variety of blade sizes: ⅛ to ¾, depending on the machine. 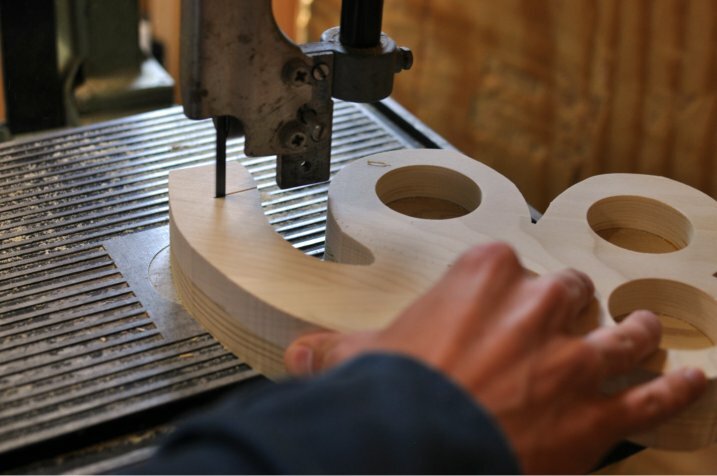 This blade is about a ¼ – a narrower blade will cut more intricate curves. 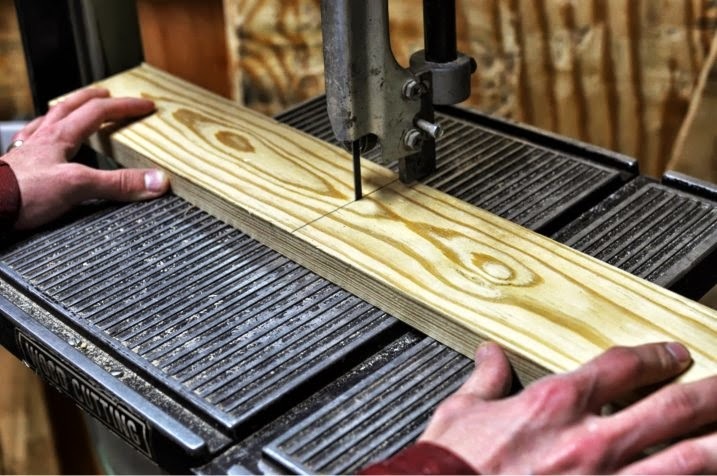 Here is a video about blade selection from Laguna Tools. You can see the two layers of wood here – the contrast is an interesting part of this flight paddle. 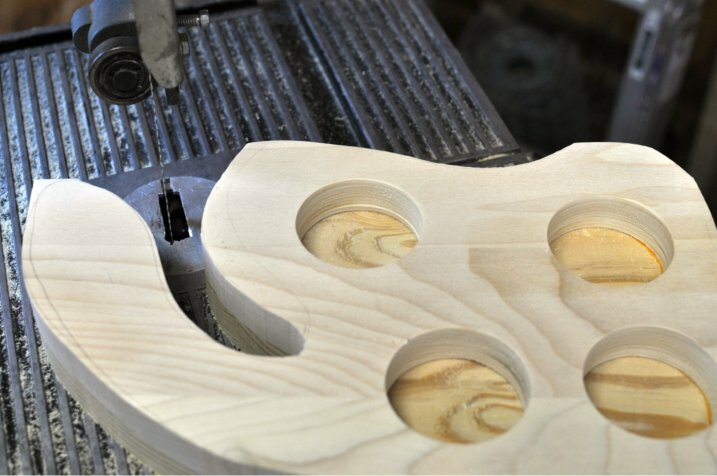 After sanding the entire piece smooth, Chelsea painted the base of the flight paddle with black lacquer. She used a dotted motif meant to be reminiscent of the lacing created by beer in a glass. She painted the insides of the indentations for the tasting glasses as well. After the paint was dry, she sprayed it with a few coats of a clear sealant. 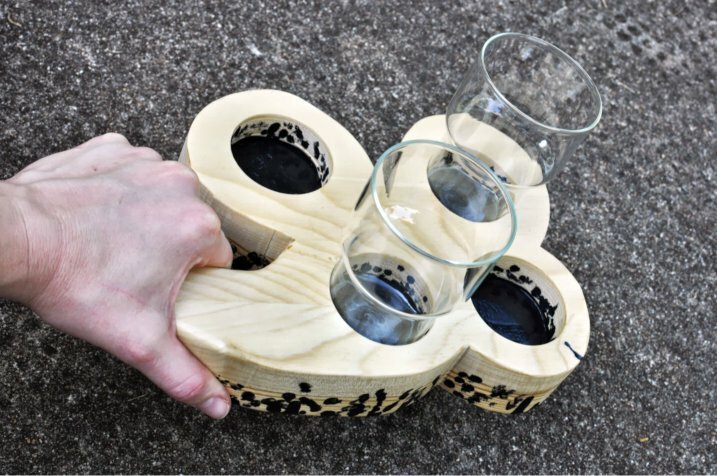 The handle works perfectly and the four glasses fit snugly in their rings. We already had this glassware, but I recommend this set of 5 oz beer taster glasses, as well. Now all we need are a few brews to sample. I love to modify old favorites to make a familiar meal feel new and refreshed. That’s exactly where this next recipe’s origins are – a childhood recipe that has already been featured on here once before in the form of Curried Oat Cakes. I swapped out a few items and added in some others for another update. I prefer to make my own sauces for my recipes, but let’s face it, everyone needs to cut corners from time to time. However, I cannot bring myself to cut corners and buy the condensed soups full of preservatives. 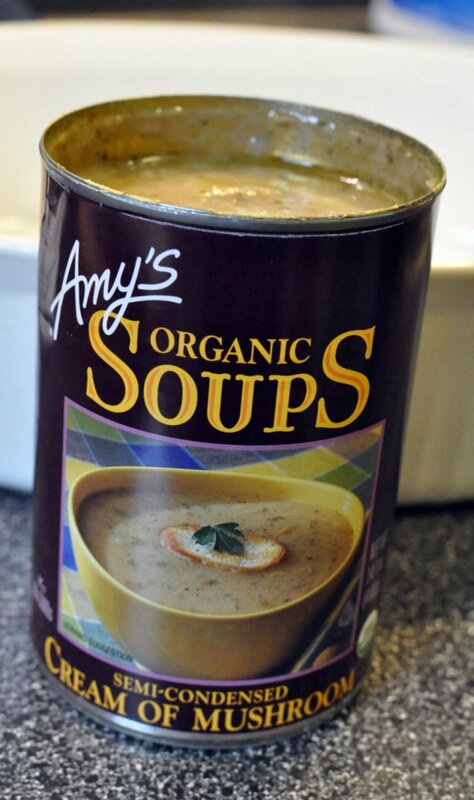 So, I find myself always turning to Amy’s canned soups when I am in a pinch. They make quite the line of soups, chili, and stews. 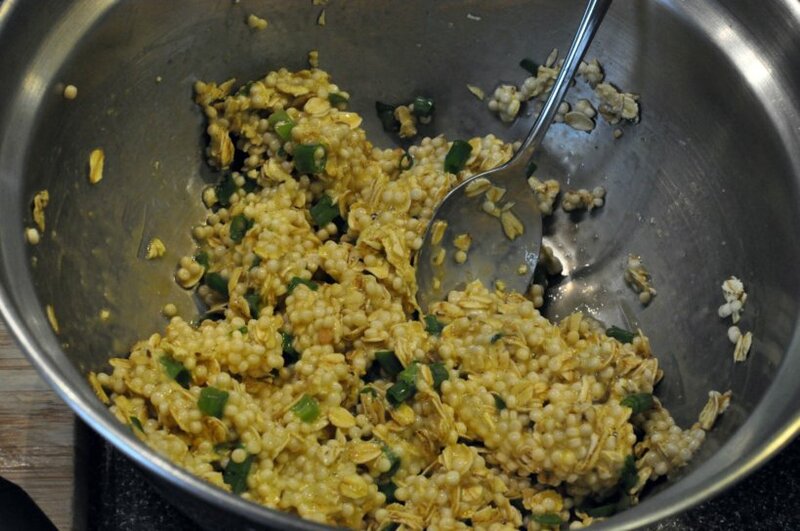 In a bowl, mix 2 eggs with 1 cup oats and 1 cup Israeli couscous, which is actually a pasta. Add ⅛ to ¼ cup chopped green onions for extra flavor. 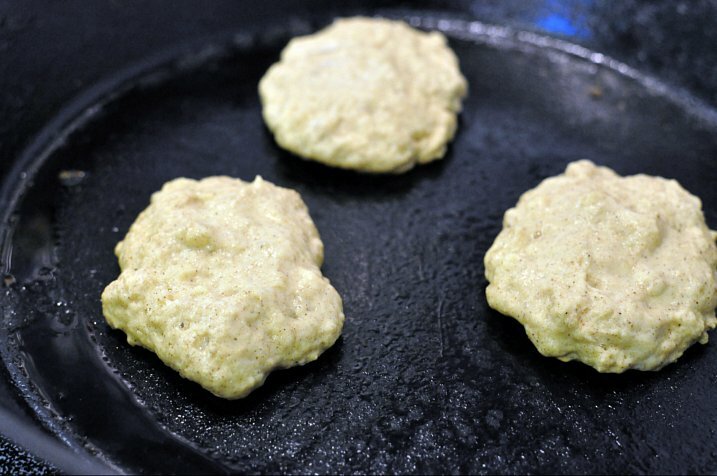 Using a spoon, form mixture into patties on a preheated skillet with 1 tablespoon oil. Pan fry 1-2 minutes per side. 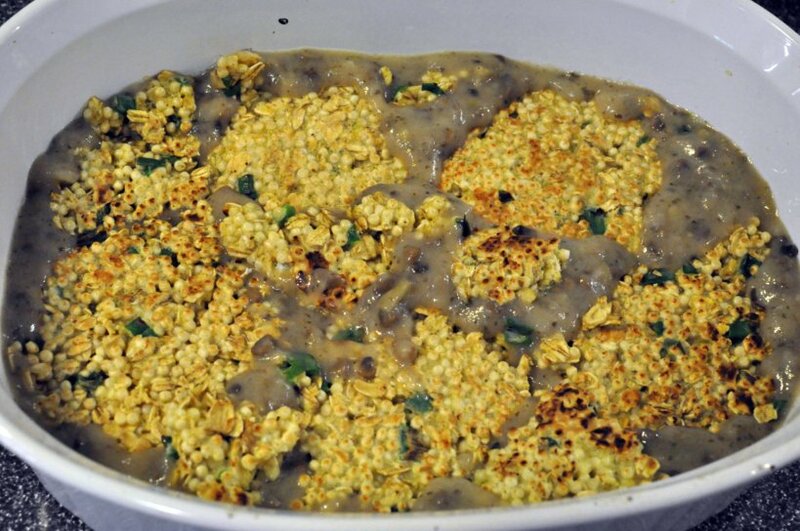 Place patties into casserole dish with 1 can of cream of mushroom soup. Use a spoon to cover patties in soup mixture. Add 1 – 2 tablespoons of milk or water to the soup mixture if it is too thick to cover all the patties. Bake in 350 degree oven for 30 to 35 minutes. Enjoy warm. This meal is satisfyingly filling for being vegetarian, I promise. The Israeli couscous adds texture and meatiness, for lack of a better word. The soup can be swapped out for other flavors and other chopped vegetables could easily be added before pan frying. 1. 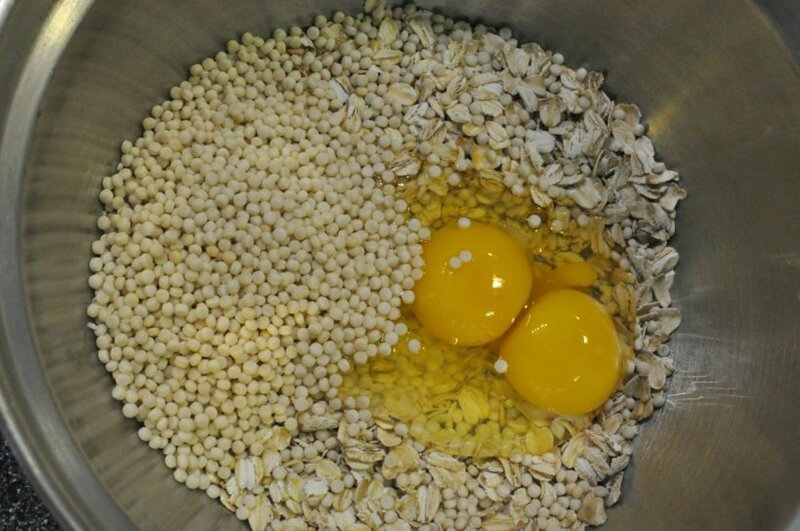 In a bowl, mix 2 eggs with 1 cup oats and 1 cup Israeli couscous, which is actually a pasta. Add ⅛ to ¼ cup chopped green onions for extra flavor. Stir mixture until well combined. 2. 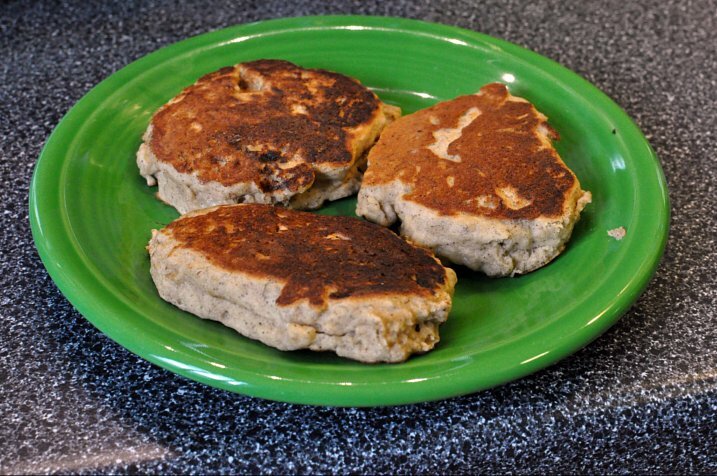 Using a spoon, form mixture into patties on a preheated skillet with 1 tablespoon oil. Pan fry 1-2 minutes per side. 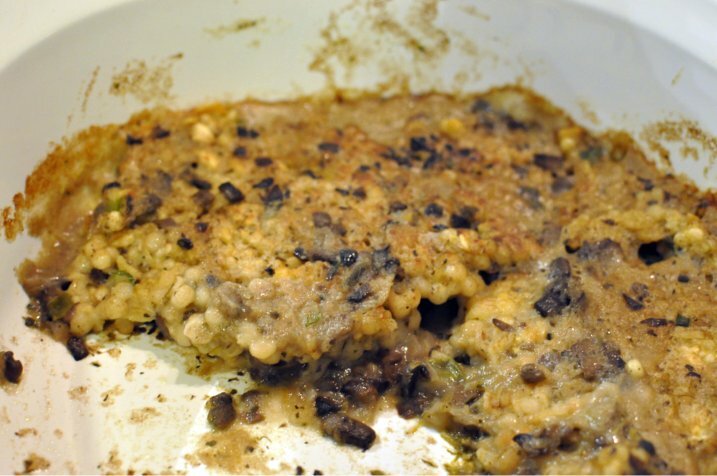 Place patties into casserole dish with 1 can of cream of mushroom soup. Use a spoon to cover patties in soup mixture. Add 1 – 2 tablespoons of milk or water to the soup mixture if it is too thick to cover all the patties. Bake in 350 degree oven for 30 to 35 minutes. One thing I am really looking forward to about the move back to Iowa is sweet corn. There is nothing like sinking your teeth into fresh sweet corn on the cob. I mourned sweet corn during the years I had braces and could not wait for the day to have them removed – the day AFTER yearbook pictures were taken in ninth grade. Go figure. Anyway, we had our first sweet corn of the season recently and I tried out three wonderful flavor mixtures the last time we made corn on the cob. Check them out below. After husking the corn, see here for a secret to husking corn that I will have to try next time, place corn onto parchment paper and prepare with seasonings. I broke my ears in half so Eric and I could try all three flavors and choose our favorite. 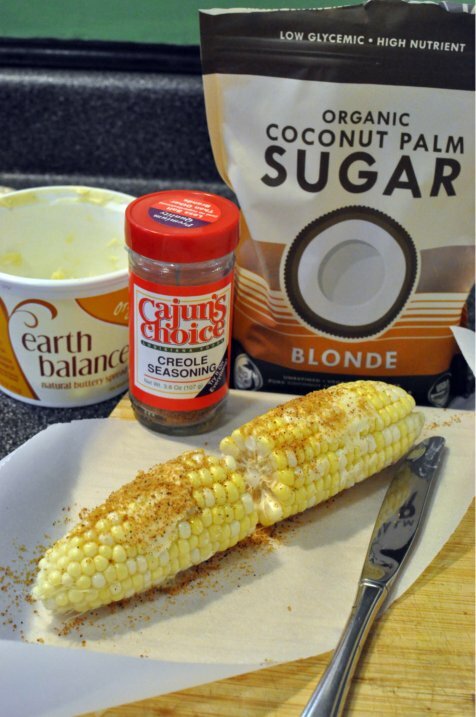 For the first ear, I used a smear of margarine, a sprinkling of coconut sugar, and Cajun seasoning. 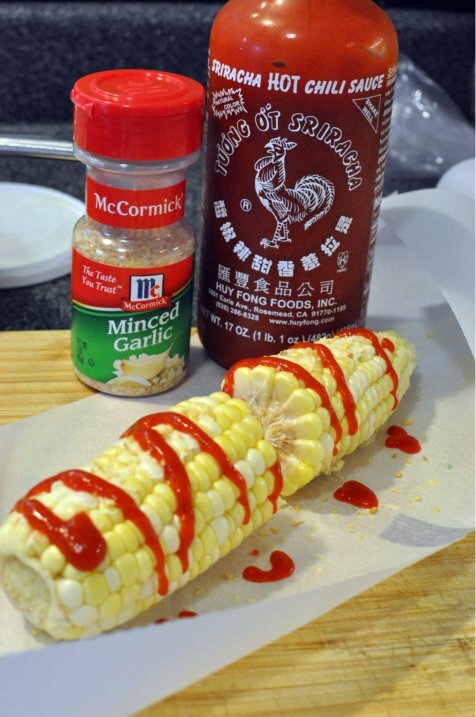 For the second ear, I used Sriracha hot sauce and minced garlic. 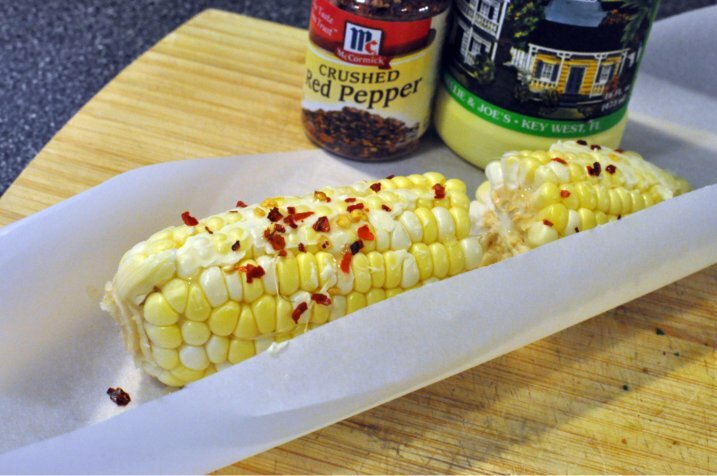 The last ear, I used a smear of margarine, a sprinkling of crushed red peppers, and a sprinkling of lime juice. I was pretty sure this one would be my favorite – there is just something about hot peppers and limes that get me every time! 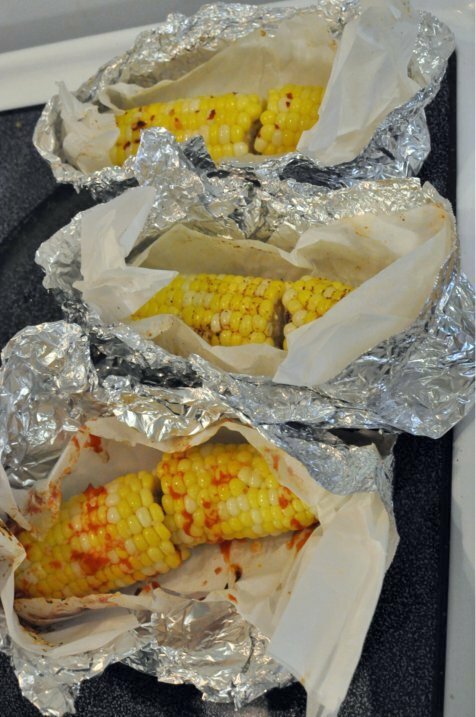 Roll the parchment around the corn cobs and then place in aluminum foil. 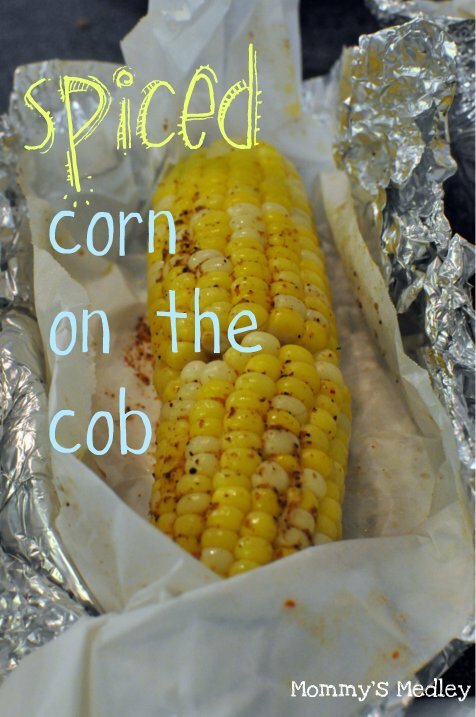 Fold the edges over the points of the cob first and then pinch long flaps together to make a mohawk on your corn. Pinch the mohawk together to ensure no loss of flavorings. Bake in a 425 degree oven for 20 to 25 minutes. 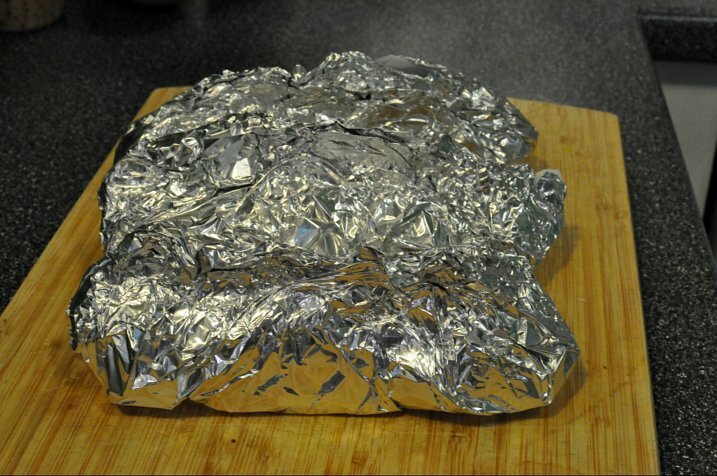 Open foil packets and allow to cool slightly before serving. Pretty sure we’d put this cookbook to good use. Eric’s favorite was the Sriracha combination, due to its spicy heat, but let’s face it, we’ll put Sriracha on anything around here. 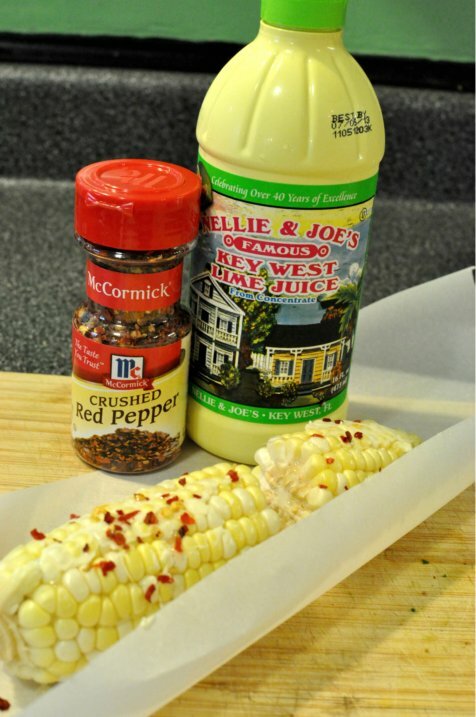 I liked the pepper and lime corn – the lime juice made the flavors of the corn and pepper so much brighter. The Cajun one was equally good – I could see that flavoring served with hush puppies. 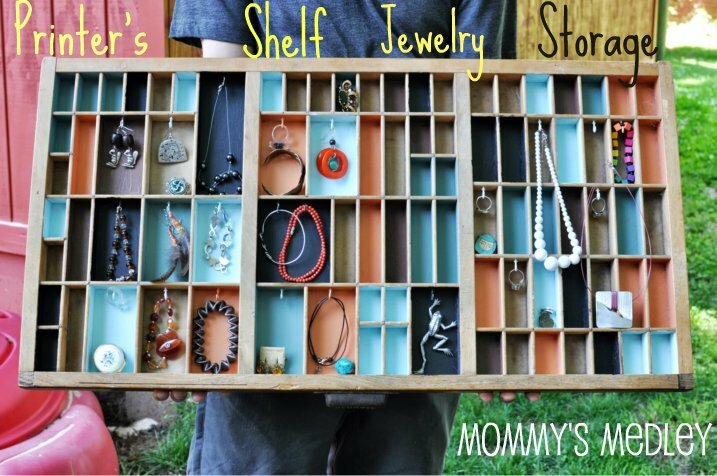 I have a lovely Mother’s Day idea for y’all. Or maybe just a new pancake idea to try this weekend. Either way, they are sure to please – bananas paired with millet flour makes a sweet but filling cake. 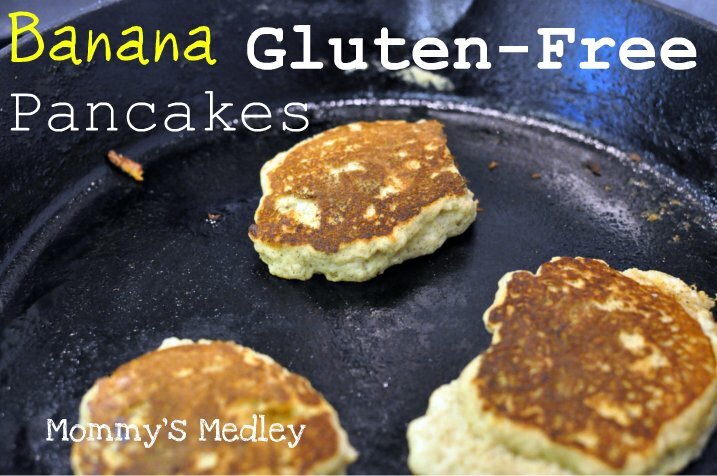 They are sugar-free, dairy-free, and gluten-free to boot. 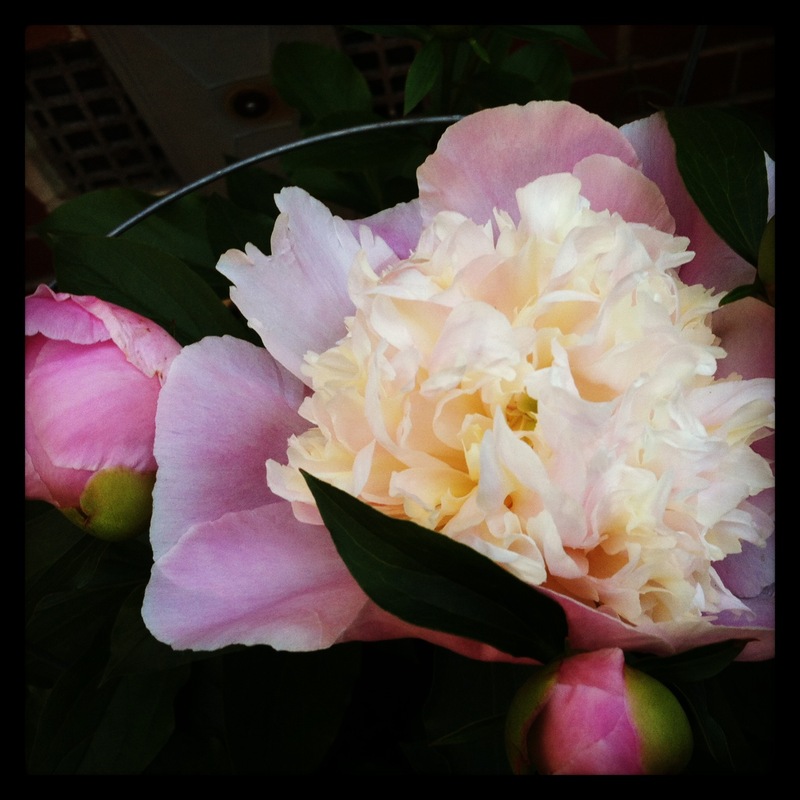 I enjoyed them this morning with my hazelnut coffee and blooming peonies. 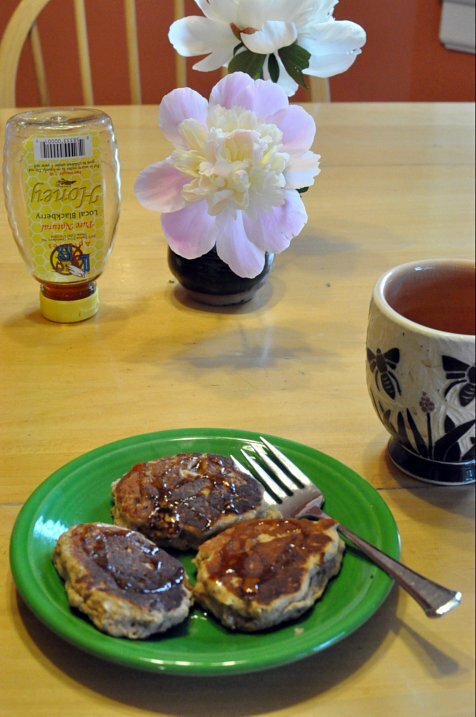 The recipe is based a pancake recipe I shared a while back, banana peach pancakes. Pancakes are the go-to weekend breakfast food in this household. Greta loves to eat her fill of pancakes and then an hour or so later, grab another pancake to eat on the go. I am impatient with the first batch of pancakes, so I have learned a few tricks to make sure the entire batch is a good one. First, make sure the pan is preheated and piping hot. 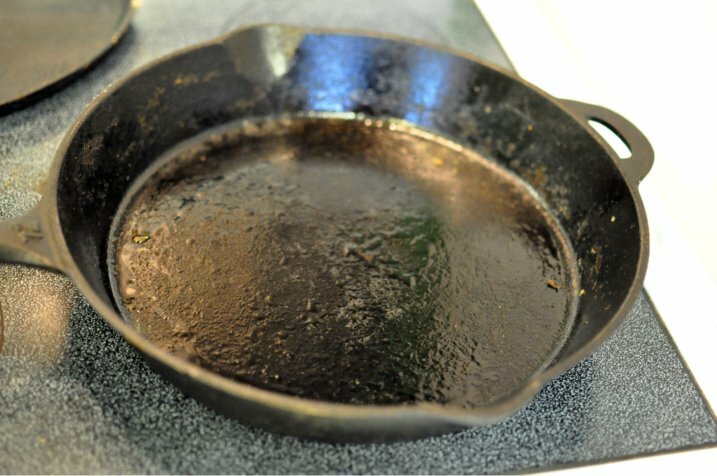 I do not use non-stick for health reasons, but rather a cast iron skillet that is well oiled. I use small amounts of batter – ¼ cup or less. This way the pancakes are Greta size. I always set a timer to ensure that I do not try to flip too soon and do not allow them to burn. 1-2 minutes per side is usually fine. When the edges look dry, it is time to flip. Do not overcrowd the skillet, then you have pancake batter all over the place. Enjoy these babies – we have already eaten ours this morning. A note on the millet flour – it will create a drier pancake, and it can almost biscuit-like if they are overcooked. I made one round that was a little too dry, so watch the pan and use your timer. 1. In a medium bowl, mix together 1-¼ cup millet flour, 1 teaspoon baking soda, 1 teaspoon baking powder, and 1 teaspoon ground cinnamon. 2. In another small bowl, stir together 2 medium mashed bananas (about ¾ cup), 1 egg, and ¼ cup almond milk. Combine wet and dry mixture in a few swift strokes, do not over mix. 3. Pour batter onto preheated and oiled pan. Bake 1-2 minutes per side. Serve with honey. One of my art teacher roles is often to teach my students that the hand made gifts are truly the best. 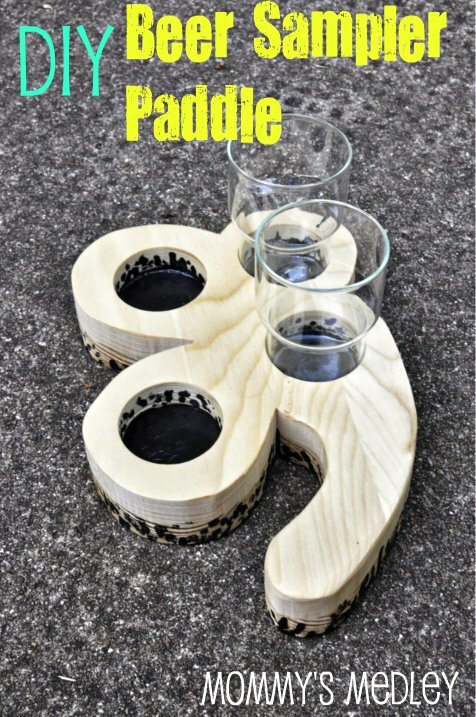 This is an easy project that is fun for all ages. You should have seen my seventh grade students working on this yesterday – the enthusiasm made my day. 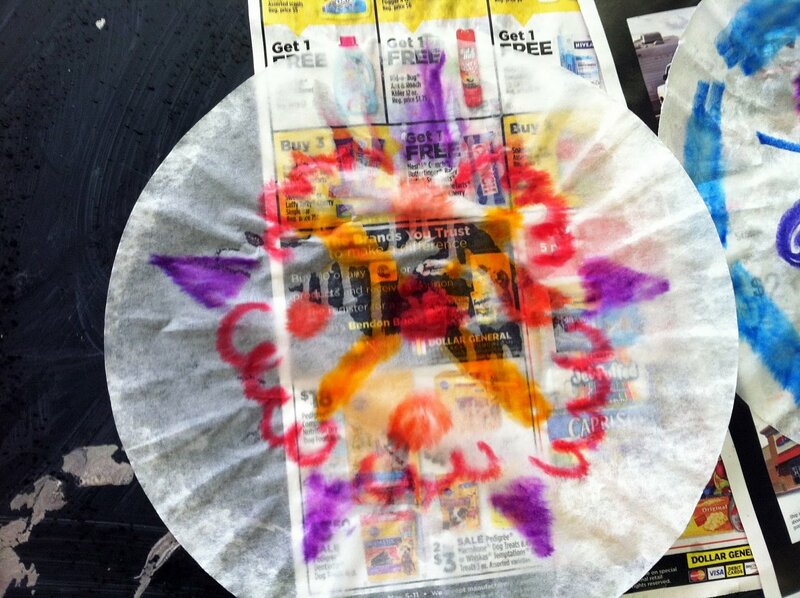 Start with plain white paper coffee filters. Draw on them with water-based markers. 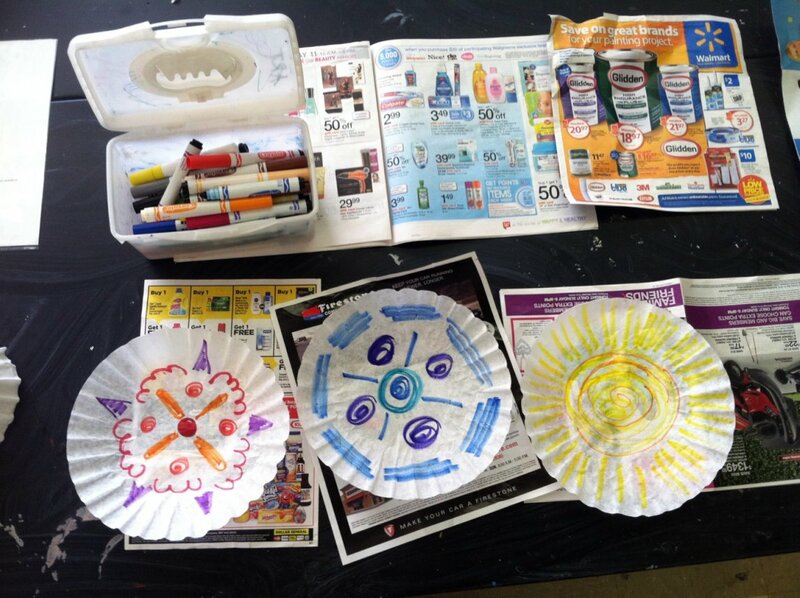 Try multiple colors, different designs, and even coloring the entire coffee filter with color. 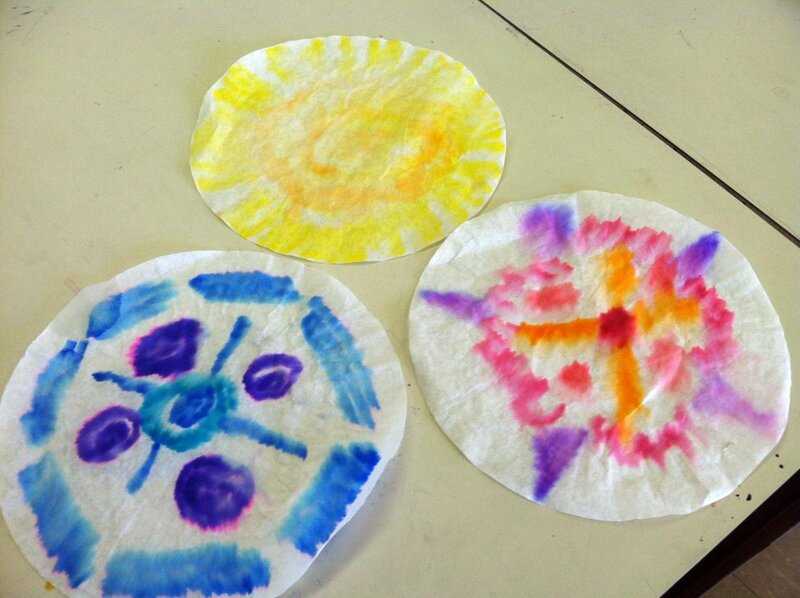 Your designs will turn into watery, tie-dye like motifs. Allow the filters to dry completely. 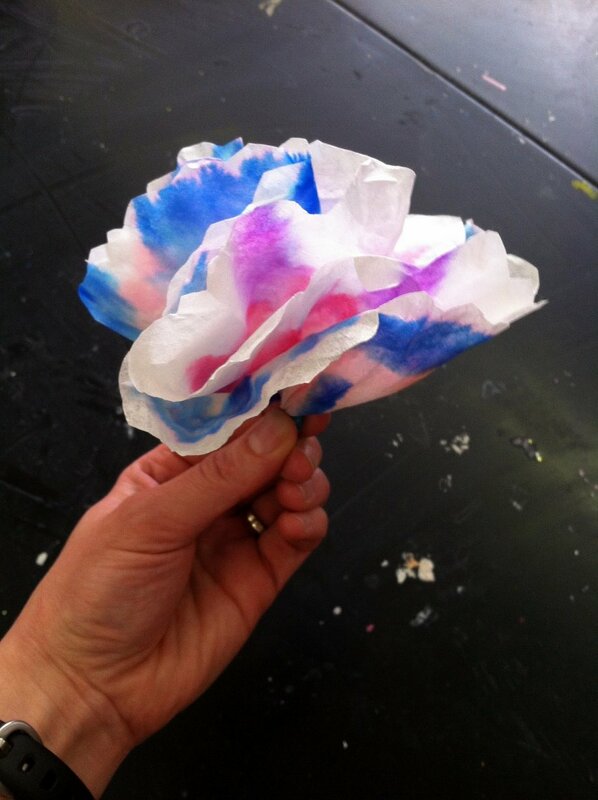 Once they are dry, you can now begin to cut them up, layer them, and create your flowers. Fold the filter in half, then in half again, and then into a pie slice shape. Cut designs along the top curved edge – like a paper snowflake. 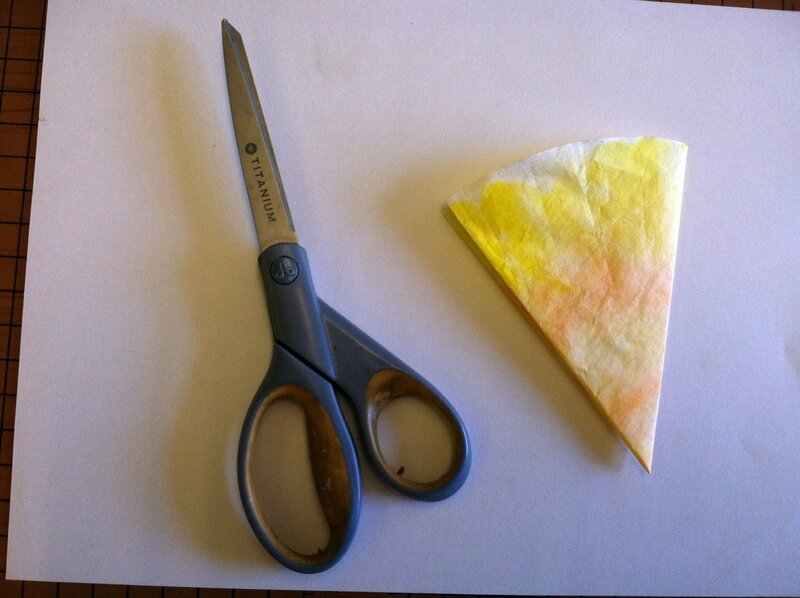 These cuts will form the petals of your flowers, so experiment with different cuts. 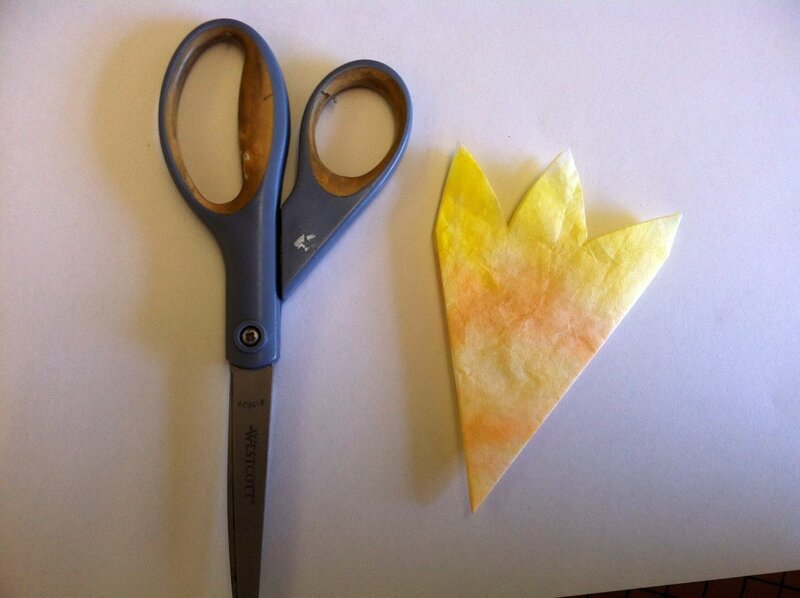 Once the petal designs are cut, open the flower up, pinch in the middle, and twist. This will create the base of the flower. 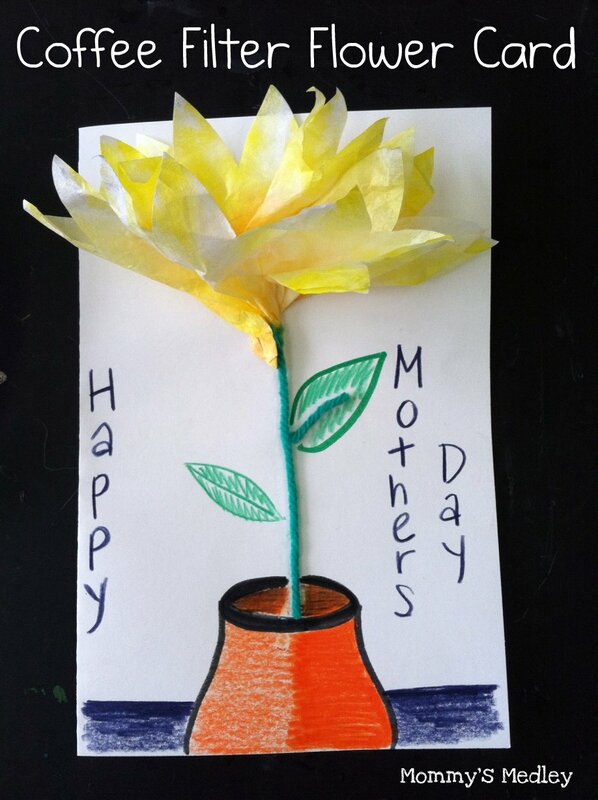 Now you can add a stem out of pipe cleaner, or glue them onto a piece of paper for a card. Add some leaves, a garden or vase, a background, and a nice note and you have a card. Wasn’t that better and more fun than buying a card in the store? Yum to this cake. 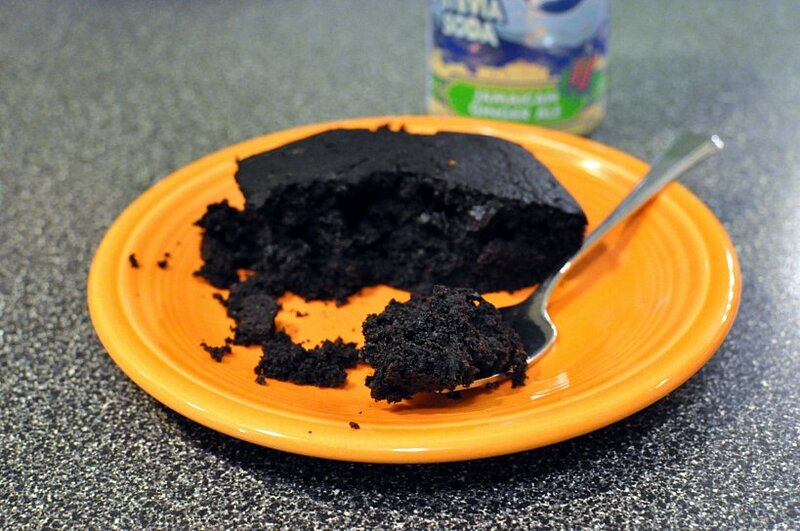 This vegan cake recipe has proven to be a regular in this household. It is so moist and fluffy without being at all complicated. One would never know it is a vegan recipe, either. The idea came to me whilst shopping in my favorite local health grocery store, Earth Fare. I was looking at the Jamaican Ginger Ale and wondering how I could make a cake with this Stevia Soda, er, I mean pop. I have to get used to saying pop again, since the big move to Iowa is looming nearer now. That reminds me, I wrote an e-mail to Earth Fare lamenting moving away from Greensboro and being unable to shop with them anymore. I basically begged them to consider a store in Des Moines. I know these kinds of e-mails are received all the time, but I thought it was worth a shot. I got a reply! Thank you for your interest and support! We opened our newest store in Noblesville, IN late last year and we are currently working on opening stores in Solon, OH and Carmel, IN in 2013. At Earth Fare we are always exploring new areas and will consider the Des Moines area for future possibilities. Thank you again and please let us know if we can be of further assistance. Anyhow, a girl can dream. 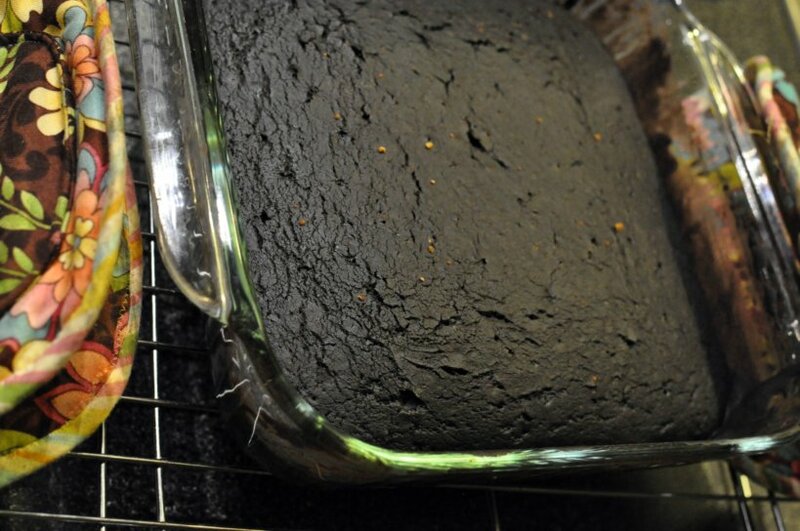 This cake is a rich dark chocolate with a sprinkling of ginger. I swapped sugar for a pop made with Stevia and coconut sugar. It would truly be a lovely Halloween cake – this plate is proof. 1. Preheat oven to 350 degrees. 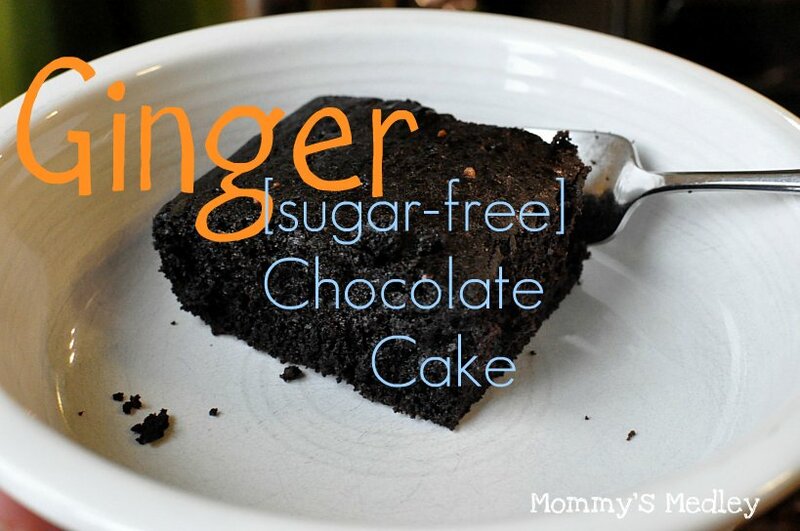 In an 8×8 inch square pan, mix 1-¼ cup flour, ½ cup coconut sugar, ⅓ cup unsweetened dark cocoa powder, 1 teaspoon ground ginger, and 1 teaspoon baking soda with fork. Mix very well. 2. Mix 1 cup room temperature ginger ale made with Stevia, 1 teaspoon vanilla, ⅓ cup vegetable oil, and 1 teaspoon apple cider vinegar in a small bowl. Add all at once to the dry ingredients. Mix well. Use a spatula to scrape sides and bottoms to ensure adequate mixing. Sprinkle a light dusting of ginger on top of batter. 3. Bake 30 minutes or til knife comes out clean. This is a perfect weeknight meal and you can easily substitute the beans and corn for other pantry staples. 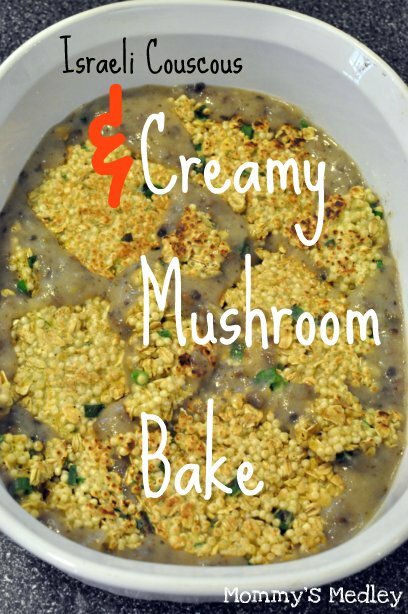 It was a crowd-pleaser, it is filling, quick & simple, and can be made for meat-lovers, vegetarians, vegans, and foodies alike. Start with salsa or enchilada sauce of your choice – I used salsa verde. 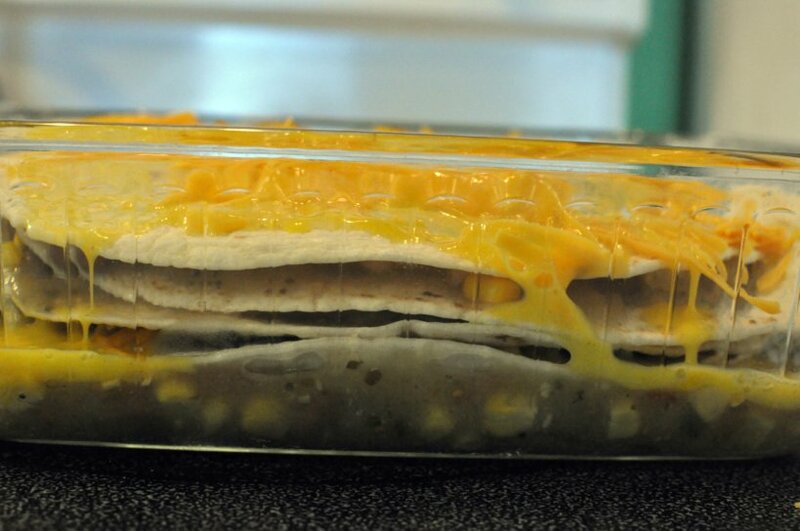 Layer the sauce, then the bean/onion mixture, then cord, cheese and top with a tortilla. Repeat until your heart’s desire or ingredients run out, whichever comes first. On the last layer, add a sprinkling of cheese. In a small bowl, whisk 2 – 3 eggs together. Pour egg mixture over the top. Look at those delicious layers! Bake in a 350 degree oven for 25 – 30 minutes or til whites are solid. Slice and enjoy. 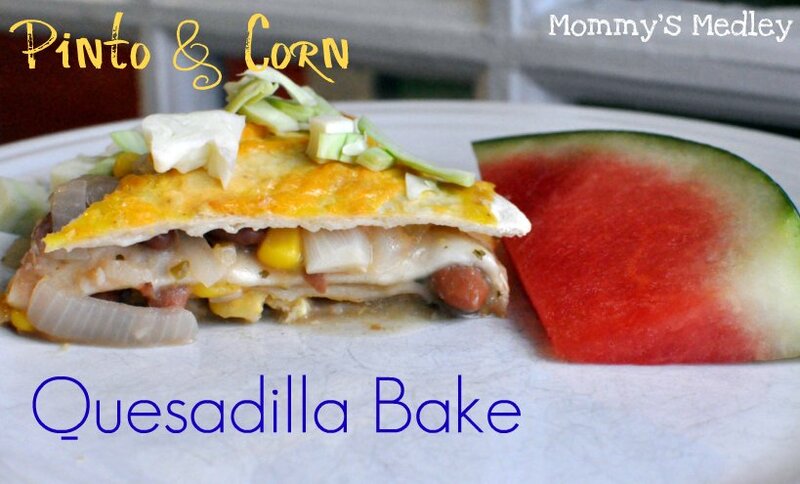 We ate our bake with watermelon and Greta gobbled this meal down. 1. In a small saucepan, saute 1 small yellow onion until soft. Add 1 teaspoon ground cumin and 15 oz of cooked, rinsed pinto beans. Stir well. Set aside. Defrost or open can of 15 oz corn. Have 4 – 5 soft taco sized tortillas ready for layering. 2. In an 8 x 8 glass baking dish, spread a layer of salsa verde. 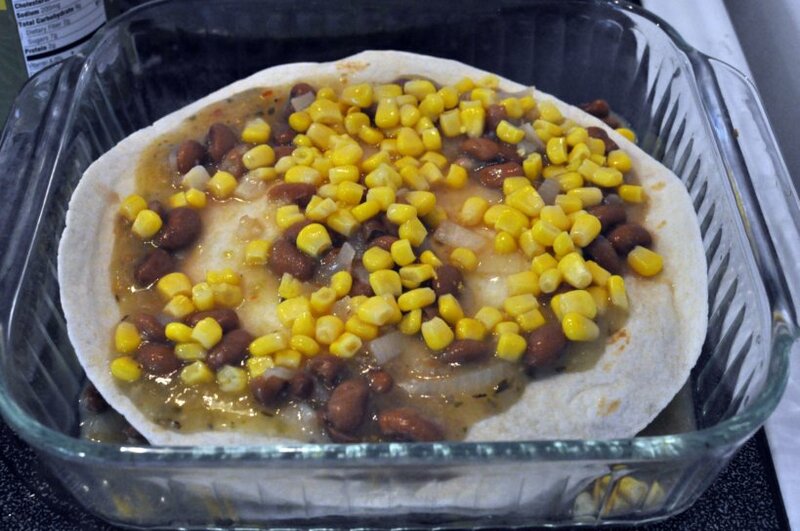 Add bean mixture (see top photo) and corn on top of salsa. 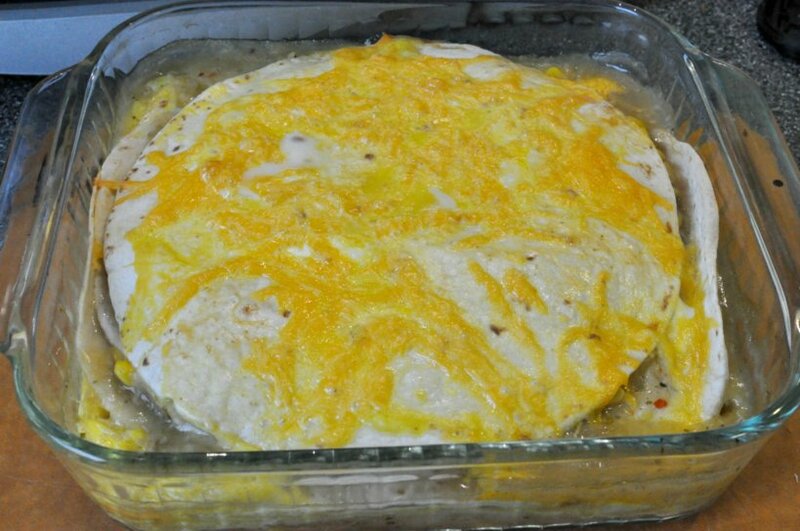 Top with tortilla and sprinkling of cheese. Repeat this step until bean mixture and corn are used up. 3. 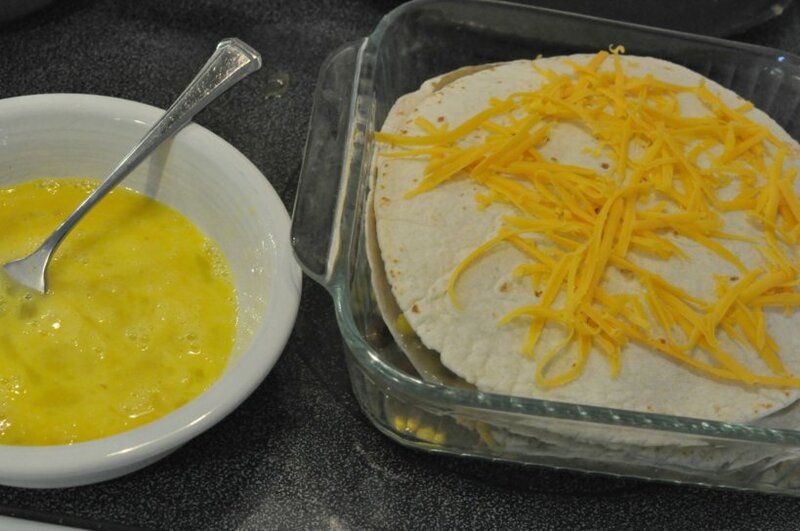 After last layer of beans and corn, place quesadilla on top and covered in sprinkled cheese. Whisk together 2-3 eggs and pour mixture over the top. 4. Bake in a 350 degree oven for 25 – 30 minutes or until bubbly and hot and egg whites are cooked solid.